Packages range from $6990 for one day event to 9990 for three day event. Celebrate life events: reunions, birthdays, retirements, & more. Have your meetings, social/group gatherings, workshops, youth/music retreats, and just quiet days here. Space for overnight, day, hostel, and short and long term sabbatical stays. We cannot accommodate wedding ceremonies or renewal of vows..
Plan your next wedding, reception, meeting, or seminar at Rocky Mount Museum. Our facilities are perfect to boost attendance, keep prices affordable, and provide a unique view of Tennessee's history. 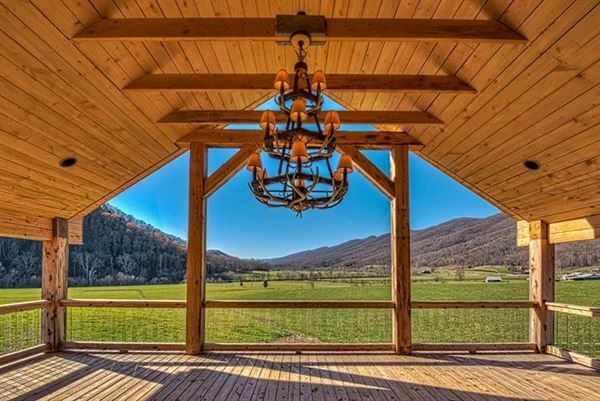 Vast vistas of surrounding mountains, forested hills and pastoral farm fields offer beautiful backdrop for outdoor wedding day activities with a safety venue for inclement weather in 150 seat theatre/auditorium. Venue needs to be seen to be fully appreciated, The meeting facilities are air conditioned, handicapped accessible and very flexible. Three seminar rooms seat 20-40 per room. Each room has its own entrance and exit. All three may be joined by opening sliding partitions to seat up to 120. The Valle Crucis Conference Center overlooks a peaceful, rural valley in the Blue Ridge Mountains. We offer our ministry of hospitality to a diverse range of church and non-profit groups from around the Southeast. Many groups say being at Valle Crucis feels like coming home. Maybe it is our informal and inspirational setting, where groups easily build community, or perhaps it is our popular homestyle meals. Whatever draws you here, you'll love the Valle as much as we do. Lodging holds up to 150 overnight guests, while our meeting spaces can accommodate up to 250. The Apple Barn is a destination wedding venue, combining rustic beauty and modern amenities.